What Makes a Good Knitting Stitch Marker? If you're a knitter, you probably know that fancy stitch markers are entirely optional. There are many creative ways to mark your spot while knitting. Everything from a contrasting colored piece of yarn to a paper clip can work. But let's be honest–how much fun is that? Instead, grab some wire, beads and a few tools to whip up some knitting stitch markers that inspire you creatively, as well as help you keep track while you are knitting. Before we get started, here are a few things that will help you make fun and versatile stitch markers. Stitch markers sit on the knitting needle and are transferred from one needle to the other while you are stitching. Consequently, the stitch marker should have a loop that is large enough to fit on a variety of different sized needles. The stitch marker will likely come in contact with the yarn or knitted fabric, so it is important that they have smooth edges so they cannot get caught in or pull the yarn. You also may want to consider the weight of the stitch markers too. 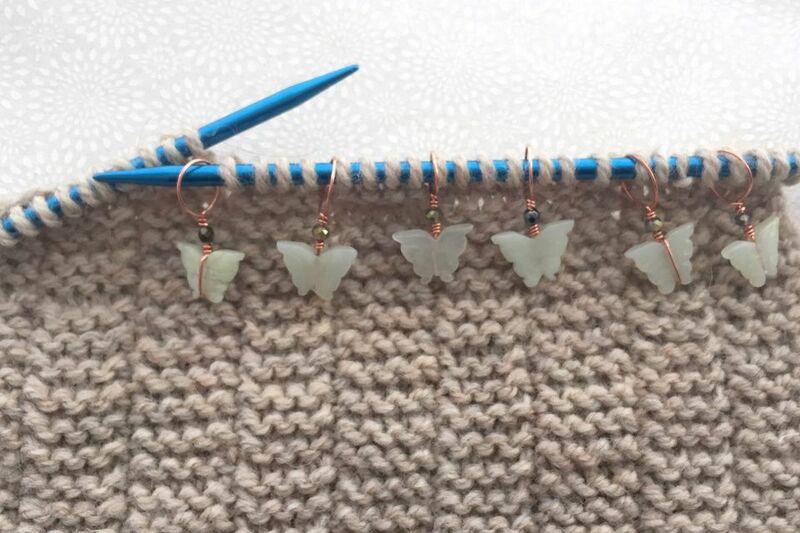 If a knit pattern calls for several stitch changes, using stitch markers that have heavy beads can make knitting unnecessarily uncomfortable. Making your own beaded stitch markers (or making them for someone else as a gift) is a great way to use up small quantities of beads you might have lying around the house, or as a way to get started with beading that isn't too difficult or time-consuming. You will also need a couple of basic wire working tools including wire cutters, flat nose pliers and a round mandrel, step pliers, and a Sharpie marker or similar sized round object. This is used to make the loop that fits on the knitting needle. 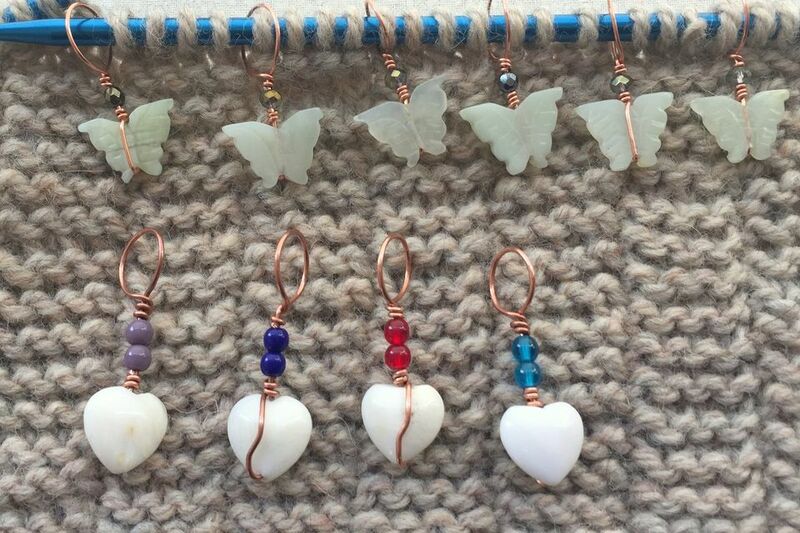 The first step to making stitch markers is to select the beads you would like to use. There are so many options, so have fun and get creative. You can have a theme, such as hearts, or a color family, or just wing it and see where your muse takes you. It's fun to vary size and color to make them interesting and unique. This project example uses one larger focal bead (about 1/2 inch long) and a smaller (4 mm) accent bead. Once you've chosen your beads, slide the larger bead onto the wire. Hold the bead about 1.5 inches from the bottom of the wire. Fold the wire up over the bead towards the hole at the top of the bead. Note that the amount of wire to leave at the bottom is approximate. You will need to leave enough wire at the bottom to fold over the bead and then wrap around the wire on top of the bead to secure it in place. Keep the wire pressed against the bead as you bend the bottom portion of the wire over the top of the bead until the wire is at a right angle. If necessary, use the flat nose pliers to press the wire against the bead. Now wrap the wire around the wire stem coming out of the top of the bead. Start on the top of the bead, keeping the wire close to, but not overlapping the prior round of wire to form a neat coil. To be sure it is secure, wrap around the wire stem at least two or three times. This is similar to step 7 of how to make a wire wrapped loop. When you are satisfied, trim the wire you were wrapping with close to the stem wire. Press the wire end so it is flush with the other wraps. Add the smaller accent bead on top of the wire coil. Leaving a small gap above the bead, bend the wire to a 90-degree angle. Place the sharpie or other round mandrel on top of the bend and shape the wire around it to make a complete circle. Make sure the wires cross to complete the circle. Remove the mandrel. Wrap the tail end of the wire around the wire stem to fill the gap above the smaller bead. This will secure the large wire wrapped loop. Trim the wire tail and press the cut end against the wire stem. Once you've made one stitch marker, keep going. Make a few more to complete a set of six or more. Remember that it is ok to make them similar or to make them slightly different so they can be used to mark different things in the same project. If you follow these instructions, one side of the bead will have the wire crossing over it while the other is plain. To make the side with the wire more interesting, you can grasp the wire with your flat nose pliers and give it a slight twist. This will also tighten the wire against the bead. Once you get the hang of it, making stitch markers does not take a lot of time and can be a lot of fun. In an evening of work, you can make enough to keep and some to give. It's a great way to incorporate a different craft into knitting.